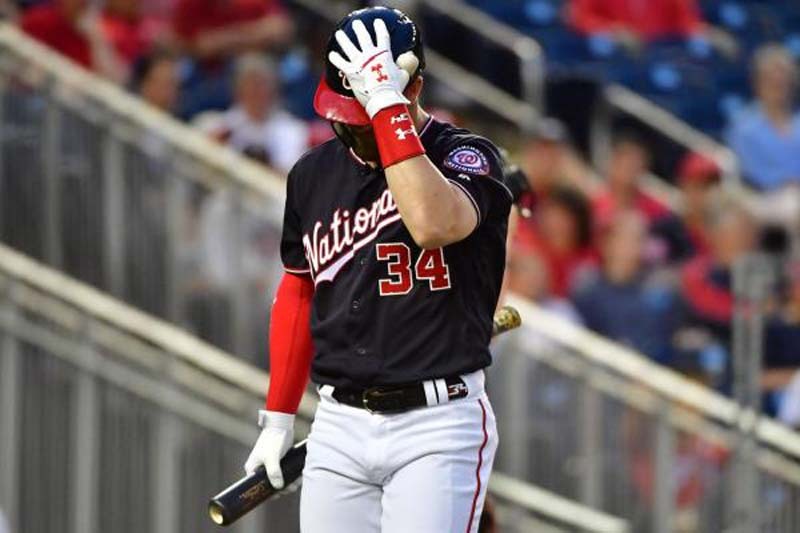 Bryce Harper's helmet stopped him from getting a double during the Washington Nationals' 11-2 win against the Tampa Bay Rays Wednesday in Washington, D.C. The five-time All-Star was at the plate in the bottom of the fourth inning during the incident at Nationals Park. Washington led Tampa Bay 6-1 at the time. Harper stepped into the box to face Rays lefty Ryan Yarbrough for the sequence. Yarbrough led Harper with a 1-2 count before tossing a ball with his fourth pitch. Harper then smacked a 79.2-mph curveball to shallow left field. He flew around first base with a double in mind the whole way. Rays left fielder Johnny Field gunned a throw to second base, but Harper looked to have enough speed to beat the ball to the bag. Until his helmet fell off. Harper's headwear came flying off of his hair as he was in between first and second base. The helmet then clipped his right heel. Umpires initially ruled that Harper was safe at the bag. Upon further review, they overturned the call, determining that Brad Miller applied the tag on Harper before he reached second base. Harper went 1-for-3 on the day, with a walk, a run scored and two strikeouts. Anthony Rendon led the Nationals at the plate, going 4-for-5, with four runs scored and three RBIs. Rendon had two doubles in the victory.